Market update Fox Valley-February 2 2019. New listings were lower this week 181 new listings this week compared to 209 last week. Not too bad with the sub zero temperatures we had for 3 days this week. Closed listing almost doubled. 141 closing this week compared to 82 last week. Unbelievable that some of these closings still happened with the sub zero temperatures we had for the last 3 days of the month. These people will definitely remember their closing and moving day! 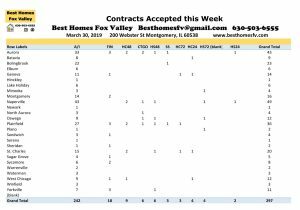 Contracts accepted this week were slightly higher this week. 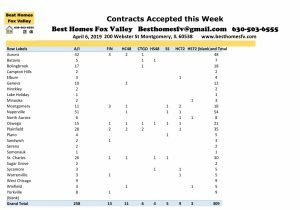 181 contracts accepted this week compared to 172 last week. Sub zero temperatures did not keep people from making decisions on buying or selling. Applications like Docusign have really helped with getting signatures when it is not possible to get them in person. Some of these might have been postponed because of the weather. 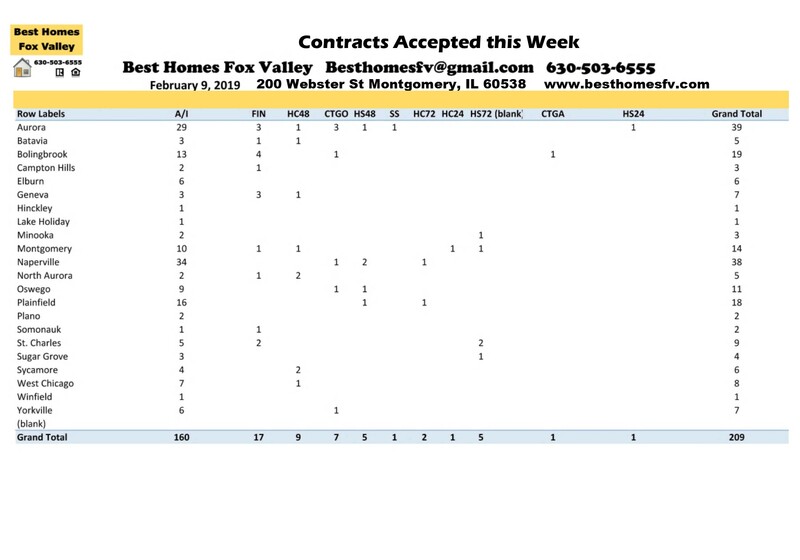 Short sales were down this week. 1 this week compared to 3 last week. The 1 was in Aurora. Now they will be submitted to the lender to see if they will also accept as written. Sellers accepted contracts that are contingent on the Buyer closing on their current home before purchasing. 4 with a kick-out clause of 72 hours, 6 with 48 hours and 1 with 24 hours. 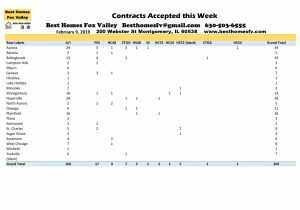 Contracts were also accepted by Sellers that are contingent on the Buyer selling and closing on their current home before purchasing. 4 with a kick-out clause of 72 hours and 4 with 48 hours. 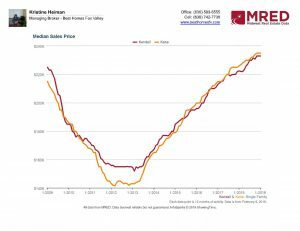 The market is still moving along. Spring market is just around the corner. 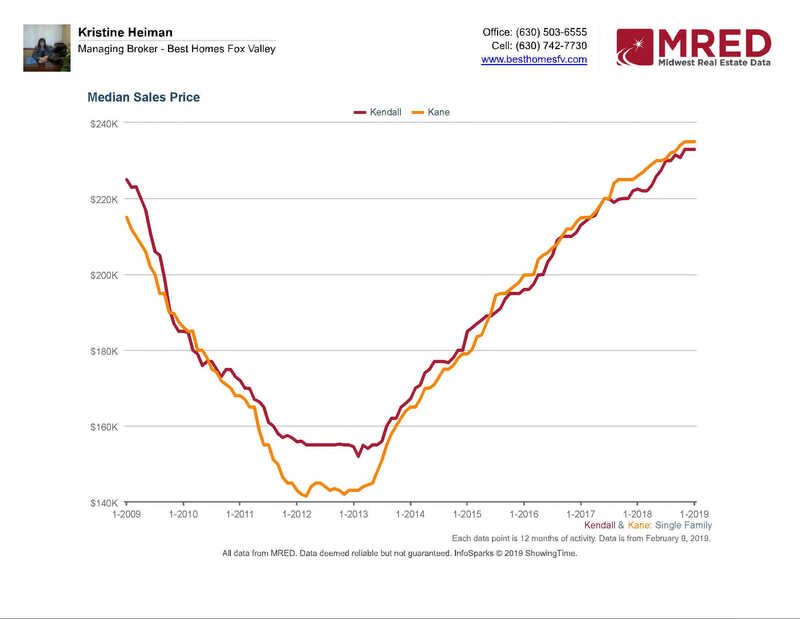 Now might be the best time to sell with less competition. We can update the value of your home in the current market and provide you with a net proceeds that shows the expenses to sell. This will be updated when an offer comes in and we know all the terms. 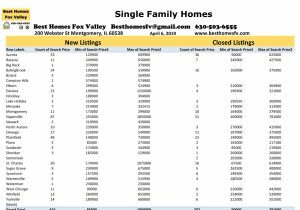 Let you know what you need to do to get your home market ready. If you are thinking about buying a home you need to talk to a loan officer to get pre-qualified. They will tell you the best type of loan and the price range you should be looking in. The type of loan will determine what condition of the homes you should be looking at. Market Update Fox Valley-February 2 2019. Have a great week!